For a little while, in the mid to late 1980s, Fenway Park belonged to Dwight Evans. Carl Yastrzemski had retired, Jim Rice had morphed from the scariest hitter in baseball to the rally-killing inspiration for the mocking “6-4-3” chant, and Wade Boggs’s robotic mass production of basehits had proven capable of inspiring from the hometown crowd only admiration and respect, not love. So the biggest, deepest roars came for the tall mustachioed man who in his late-blooming prime seemed to do everything on the field with majestic, regal calm: The way he loped out to take his position in right field, the way he warmed up his famous arm by throwing laser beams out of a sleepy, feline half-windup to some bullpen lackey armed with a catcher’s mitt, the way he slowly strode to the plate in a big spot, letting the pitcher stew in the sound rising from every corner of the old ballpark, the way he then coiled himself down into his unusual disciple-of-Hriniak stance (different from the stance of the younger clean-cut version of the man shown above), the newer stance a back-slanting crouch, weight on his right foot, left foot bent and extended with toe just touching the dirt, bat back and nearly horizontal and loose-gripped and seeming to slowly pulse as if in measured counterpoint to the larger, louder thrumming of the word Dewey on 33,000 tongues. 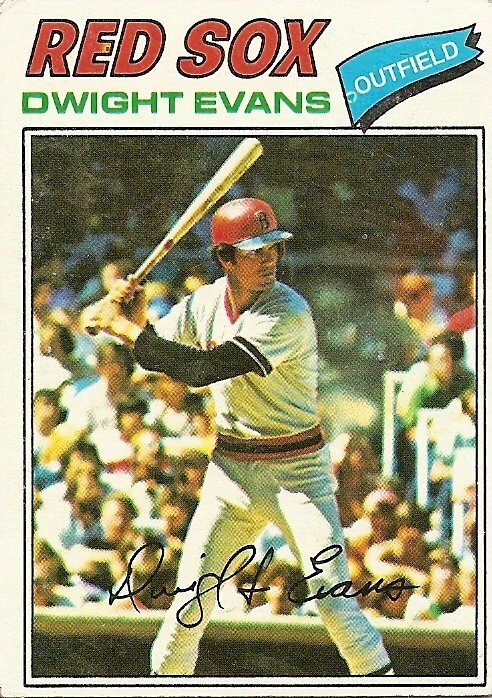 I spent two summers working at a gas station and living with my grandfather on Cape Cod during the era when Dwight Evans was king. I made my way to Fenway more often during those years than I ever had or ever would, taking a quick busride in from Hyannis to meet up with friends or sometimes just to go to a game by myself. Even if I was on my own, maybe especially when I was on my own, I threw my voice into the chant for Dwight Evans like I was throwing a thin dry stick onto a fire. I was 17, 18, hadn’t amounted to much, had an expulsion and a GED diploma in my recent past, had no skills, no girl and absolutely no prospects for a girl, and no vision for the future beyond vague thoughts of some sort of selective nuclear holocaust that would rid the world of everyone but me and the Dallas Cowboys Cheerleaders. Most days I pumped gas and wiped windows with a squeegie and sat behind a register bored out of my skull until it was time to pedal my grandfather’s creaky bicycle home. My grandfather kept the fridge stocked with Miller Genuine Draft. He also kept frosted mugs in the freezer. Often there was a Red Sox game on Channel 38. These things–beer in frosted mugs, ample games on TV–had eluded me in my youth in rural Vermont, and suddenly here they were, consolation prizes to numb the general sense that my life was like a game in the hands of an unraveling bullpen. The television was in my grandfather’s bedroom, the one he’d shared with my grandmother until she’d died in her sleep five or six years earlier. We watched the games together, my grandfather in his remote-controlled La-Z-Boy and me in my grandfather’s remote-controlled bed. The two of us didn’t talk much, but sometimes I’d explain something about the game to my grandfather, who though always ready to enthusiastically support something had never been a huge sports fan. Sometimes we wouldn’t talk but would just use our respective remote control devices to raise and lower our torsos or raise and lower our legs. My grandfather had trouble breathing, especially in the second of those two years, and in the quiet moments where no body parts were being raised or lowered you could hear the sound of the oxygen machine, which had a clear rubber tube running from its place in the next room up into my grandfather’s nostrils. Sometimes the game would devolve into nothing, a slow dissolve into another loss, but then again sometimes, and more and more that second year, the game seemed to build to a point, a crux, a moment when someone on the Red Sox had a chance to step forward and scatter the creeping ubiquitous fog of failure. My memory is full of distortions, is actually nothing but distortions, so I have no idea how many times this actually happened, but when I think of those years I see Dwight Evans slowly striding to the plate with the game on the line, and I see myself lying on my grandfather’s orthopedic bed, and I hear myself praying silently but with all my might for Dewey to come through. And I see Dewey working the count to 3 and 1, the chant getting louder with each pitch until it blooms into a greater wordless roar. And I see Dewey uncoiling and swinging and sending the motherfucking ball onto Lansdowne Street. You are currently browsing the archives for the Dwight Evans category.